Fire Protection Associations are formed and governed under the National Veld and Forest Fire Act (Act 101 of 1998) as voluntary associations of Landowners who wish to cooperate for the purpose of predicting, preventing, managing and extinguishing veldfires. The Winelands Fire Protection Association was registered with the Department of Agriculture, Forestry and Fisheries (Registration number: 1170/02) in November 2014 amalgamating the former Stellenbosch, Tulbach-Wolseley, Ceres-Witzenberg, Ceres-Kouebokkeveld, Rooiberg, Warmbokkeveld and Kouebokkeveld FPAs. Beginning of 2018 the Breede Valley FPA also joined. 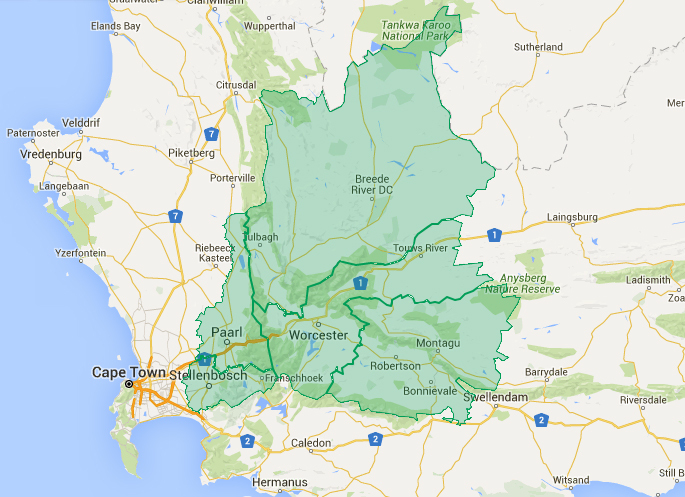 The boundary is now the same as the Cape Winelands District Municipality with an area of 2,158,000ha. See map on left. In January 2018 the WFPA was registered as a Non Profit Organisation with the Department of Social Development (Registration number: 200-807 NPO). The WFPA has a strong working relationship with the Cape Winelands District Municipality and CapeNature including through the Cape Winelands District Fire Work Group and is solidified through signed agreements. The Winelands FPA is not a firefighting organisation. Fire suppression operations are conducted according to the Fire Brigade Services Act and remain the responsibility of the Cape Winelands District Municipality.